Look Ma, no grill! Seasoned just right and slow cooked in the oven in a large pan along with potatoes and onions, these baby back ribs come out sweet, spicy, tangy and falling off the bone. See recipe below. This one-pan method for baby back ribs is sure to be a crowd pleaser and is as close to no-fuss cooking as you can get. Cleanup’s a breeze, too. We use a 12.5″ Swiss Diamond pan – our wagon wheel – for this kind of cooking. It’s heavy, oven-safe and non-stick. Mirin, a very sweet rice wine used liberally in Japanese cooking, gives this dish a pleasant sweetness complementing the heat. Rub plenty of the dry chili-based rub into each set of ribs. Set aside. Place roughly equal portions of mirin, Cholula sauce and olive oil in a large, oven-safe frying pan (one that has a lid) and mix together over low heat. Stir in a little Mongolia fire oil or similarly spicy oil. Stir in mesquite seasoning, salt and pepper. There should be enough liquid to amply cover the bottom of the pan. Add the ribs to the pan, turning each piece so that they are coated with liquid. Place meat side down, cover the pan with a lid and place in the oven. Cook for 30 minutes. Remove the pan from the oven. Turn the ribs over so that they are bone side down. Add garlic, onions, potatoes and beans. Cover the pan and return to the oven. Cook for an additional hour. 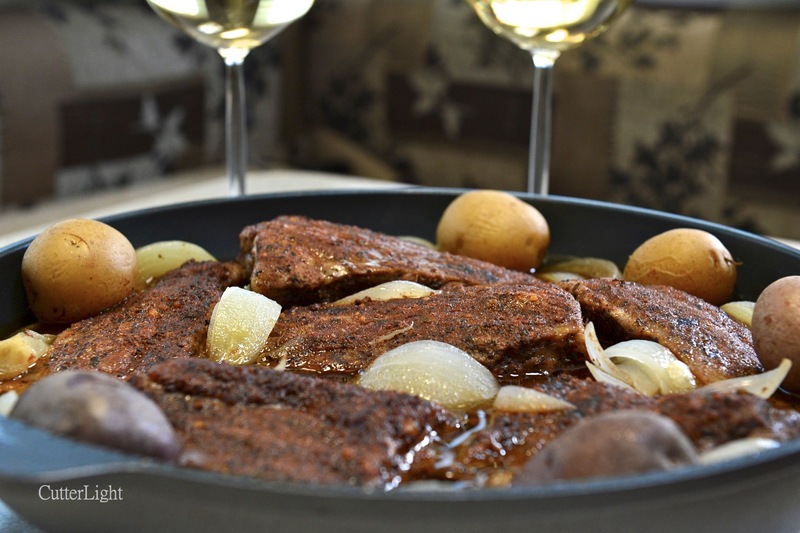 A dry or semi-dry Riesling is an ideal wine to pair with spicy pork ribs. The soup from leftovers is amazing!